It's interesting how much time away from a project can influence your feelings towards it. I was tinkering with my piece today and instead of being frustrated at the ghetto Protools program in the studio and everything it can't do...I just left. It was better than doing something I would regret. I'm not sure what that would have been...since Protools is an inanimate entity...but it wouldn't have been good...trust me. Or worse, it would have been my piece that would have suffered. 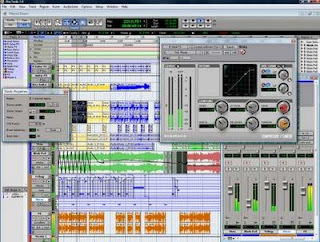 I am hoping after a two day break Protools will be more cooperative with me. I still have a lot of finishing touches and edits that I need to do on my piece but I am also at the point where I just want to get it finished. Thank goodness I have a deadline or else I could spend forever just playing around with it! I am writing finals for the next week so I won't have a massive amount of updates but I will be competing with Belle Canto at the St. Albert Rotary festival on Friday. I am sure I will have some thoughts about our performance! It's good to walk away - you might just end up making the same mistakes over and over again. Hopefully when you get back at it, it will work for you. Good luck finishing your piece!